Author Bio: Phil Chapman has 23 Years RAF/MoD experience as a Chief Technician. Phil has 5 years experience as a Microsoft Certified Trainer delivering Microsoft and CompTia training courses. Phil is a Lead Instructor for Windows 8 Training with Firebrand. The advent of a new Windows operating system is always heralded with pomp and ceremony. And normally from those of us who are tasked with deploying and administering the new beast – some trepidation. 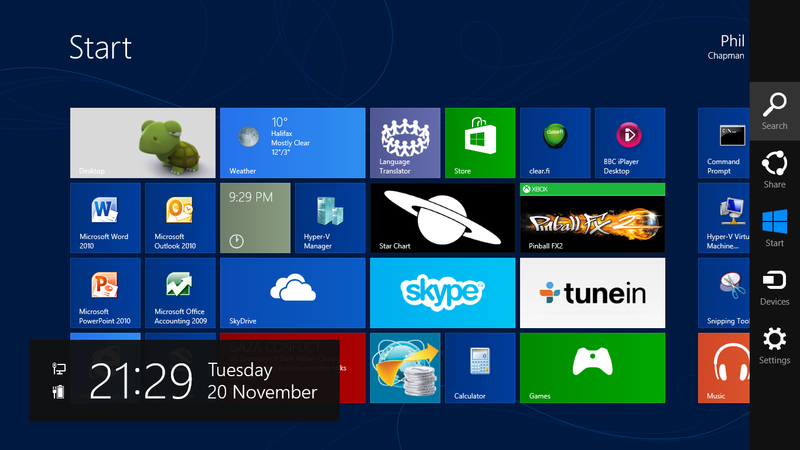 Microsoft Windows 8 was no different – with plenty of media hype, secrecy and intrigue over the final interface. Combine this with the new hardware of course, and we had the usual fear of the unknown! For those of us that were keeping a close eye on the development of the system, the fear was mostly around how they were going to improve upon Windows 7. If operating systems were Olympic athletes, I’d hand-out gold medals to Windows XP (a marathon stint, at the top of its game) and Windows 7 (for taking the baton from Vista and crossing the line in style). Though Windows Vista would pick-up a bronze, just because it’s the closest colour to brown! Vista aside, Windows 8 has a hard act to follow – but comes from a good pedigree. Windows 7 gave us everything and more on the network, inherited from the ageing XP. And although most of us choose to ignore or ridicule Vista – it was a victim of poor timing more than poor design. Change is inevitable in IT. Though Microsoft has chosen not to try to totally reinvent the wheel, and it seems to have found the happy balance between keeping the legacy of Windows 7, while creating a desktop interface that has never been seen before. The biggest hurdle is finding where everything is! When you first install Windows 8, you’re given the option to select a Windows Live (online) ID. This ties-in all online applications, and immediately allows for the personalisation of the interface to suit you. If Windows ID is not for you, a ‘normal’ local user account is available with profile to match. Once you’ve launched the new-look GUI interface, your ‘live tiles’ leap into action; making the experience as personal and interactive as you like. You can add new application tiles, increase and decrease their size, and de-activate the live aspects to suit. One downside to this is the impact that this has on resources, if you inadvertently leave your application in live play and switch to the desktop. It is likely that none of this will affect the Enterprise user, as applications will continue to be deployed to the desktop or virtualized as before. However, advancements have been made in supporting the client when working with Cloud-based resources, Remote Desktop Services and VPN. Not least, the more ‘streamlined’ and infrastructure friendly approach to Direct Access. The corners of the screen are the key to discovery with Windows 8: • Click bottom left – allows you to toggle between Desktop and Start Screen • Right-click bottom left of the Desktop – opens up administrative features, including the run command and search • Click top left of the Start Screen – allows you to see and toggle between most recently used applications (including those still running in the background). • Top right / bottom right – opens up the Charms Bar, which allows you to configure several settings. All explained below. Settings – allows for the control of display settings, a direct link to the Control Panel, power options (yes, this is where you power down or restart a Windows 8 machine! ), personalisation settings and a quick link for simple PC configuration changes.